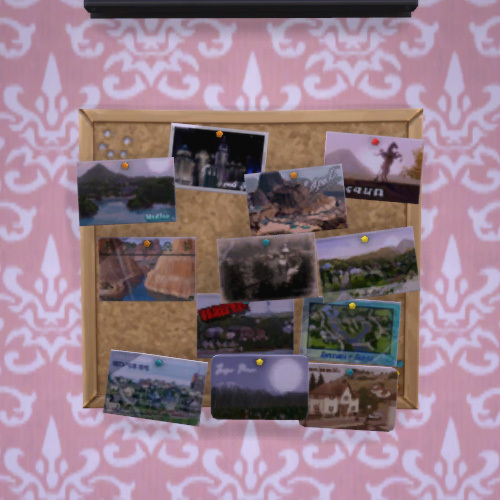 Collectibles Collections for The Sims 4. ♥ (Insects) – See Outdoor Retreat. ♥ Fish – See Fishing. ♥ Plants – See Gardening. ♥ Microscope Prints, Space Prints – See Logic. ♥ Aliens, Space Rocks – Rocket ship missions. ♥ Crystals, Fossils, Metals, Elements – A matter of patiently digging. 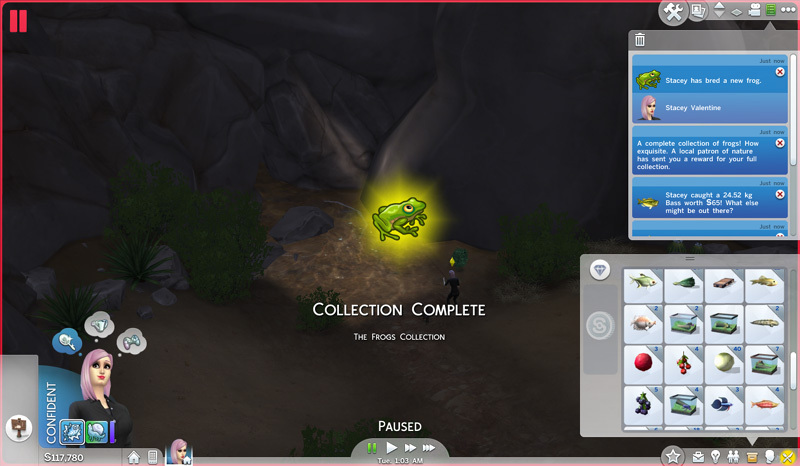 ♥ Collector (Starting with a Nature Aspiration) – Find rare collectibles more often. ♥ Geek – Find rare collectibles more often. For dig sites (Crystals, Fossils, Metals), spawns are different by neighbourhood/world. If you only dig around your home lot, you will find yourself missing a few commons. From digging up a Mysterious Time Capsule. Treasure Maps always give Time Capsules. Once you’ve completed your MySims collection, sell the maps to get a different collectible from the site. With a Treasure Map, you may (very rarely) dig up a Madame Zoe’s Voodoo Doll (which can also be bought with high enough Mischief). Once you have two frogs in your inventory, you get the option to “Breed Frog With…”. When bred, you will get a frog of the same type as either parent or a crossbreed. I find the best way to get frogs is to spam a frog pond. You can keep catching frogs from the pond without a timer. There’s a pond in each park and in Sylvan Glade. The 25 types of Frogs fit nicely into this 5×5 table (which took forever to compile). ♥ To see what frog you may get, find both of them on the table. The crossbreed will be at one of the intersections. If they are both in the same row or column, the crossbreed will be on the same row or column. ♥ To see which frogs you need to attempt a particular crossbreed, find your target on the list, then cross one frog from the same row with one from the same column; or two frogs from the same row or column. ♥ For an example from my testing, from Striped Heart + Sunflower, I have only bred Striped Heart and Sunflower (parents), as well as Heart and Tiger (intersections). ♥ This doesn’t work all the time. From Striped Dirt + Spotted Eggplant, I got Dirtsurfer, Dirtwhirl, Surfer Eggplant, Striped Eggplant and Eggplant Whirl (all same column as a parent), as well as Striped Eggplant and Spotted Dirt (intersections). The complete frog collection. You can see the grouping by row (markings) and column (colour). 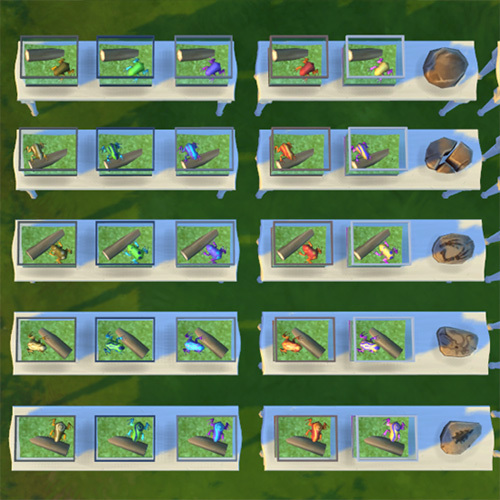 Arranging them like this makes it easy to breed the missing slots; just choose one frog from the same row and another from the same column. My last frog was a Heartsurfer, from Striped Heart + Sunsurfer. As part of our Green Initiative, while reading this site, please refrain from breathing. Love begins with a smile, blooms with a kiss, and ends with a sigh.